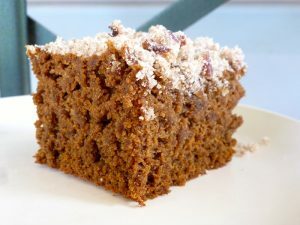 This Gluten Free Dairy Free Pumpkin Coffee Cake will add a spicy gingerbread flavored twist to your day! This recipe is adapted from the original inspiration recipe and from my original posting of it to how I really make it for my family. I have reduced the sweetener and tweeked the spiced to our tastes and added freezer instructions. Enjoy! I have also successfully used maple syrup in place of the honey in this recipe. Preheat over to 350 degrees. Oil a 9"x13" baking pan. Blend topping ingredients together. Set aside. Combine pumpkin, honey, sugar, molasses, oil, and egg or egg replacer ingredients in a large bowl. Mix together well. Add remaining ingredients (except for the raisins) to the wet mixture. Mix until just blended; do not over mix. Stir in raisins. Transfer batter to the greased baking pans. Sprinkle with streusel topping. Bake approximately 40 minutes or until a tooth pick is inserted and comes out clean. Cool on a cooling rack. Wrap well and freeze. To serve: Thaw. Warm in oven until heated through if desired.